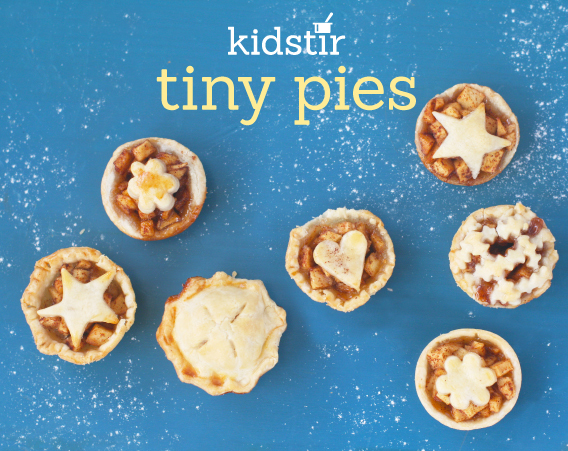 These tiny treats are a fun way to teach kids how to bake pies. We started with an all-natural storebought crust to make the pie making easier for kids. We made our pies with an apple filling, but you can use any pie filling (try sliced peaches or fresh blueberries or even dried cranberries). 1. Mix the chopped apples, sugar, cinnamon, and orange juice in a bowl. Set it aside to get nice and juicy. 2. Unroll the pie crust and place it on a piece of waxed paper or plastic wrap on your countertop. Cut out twelve 2 1/2 inch circles with a round cookie cutter or rim of a glass. Press each one into a muffin cup. 3. Gather the dough scraps and roll them out. Use tiny cookie cutters to make decorative shapes or cut thin strips for lattice toppings. 4. Add 1 rounded tablespoon of filling to each cup. Dot with a tiny piece of butter. Add a top crust with slits, a pie crust star, or a lattice top. Pinch the edges with the tines of a fork to seal. 5. Brush the mini pies with a beaten egg mixed with a little milk. Bake in a preheated oven at 375° for 15 to 17 minutes or until the filling bubbles and the crusts turn golden brown. Let the pies cool for just a few minutes in the pan, then carefully remove each one by running a sharp knife around the edges and popping it out of the pan.